If there is one term that describes the audio industry, it’s that we collectively ‘put on a good face!’ Rocky Mountain Audio Fest is a perfect example of this. As discussed previously, the hotel was running late on its rebuild and as a consequence exhibitors were given rooms of different sizes or dimensions to the ones they anticipated, and some were moved into temporary spaces. Also, many of the international representatives and travelling demonstrators were exhibiting signs of show overload as a result of a constant stream of departure lounges and hotel lobbies, seeing the world through the window of a taxi, and living out of a suitcase for months at a time. RMAF is a fixture on a now very contended international audio events circuit. It vies for its place amid a travelling circus that moves from Hong Kong to Guangzhou, then Tokyo, Silverstone, Denver, London, Toronto, Copenhagen, Old Windsor, New York, Warsaw, and so on in a matter of a few short weeks in the Autumn of each year. It would be easy for major brands to skip at least one of these events, and – being considered more of a local than a national event – RMAF could be the one in the cross-hairs. And yet, the friendliness and laid-back approach of RMAF wins out year upon year. Long may it continue! Of course, that seemingly endless stream of audio shows in the latter half of the year does pose some ennui problems for readers too, which is why we’ve focused primarily on new products in these round ups. Please note, however, as RMAF is effectively the last major show in the headphone However, there are a few good rooms that deserve praise irrespective of whether or not they featured new products. 3Beez is not a brand commonly seen outside of the US, which is a shame because its top Wax Box 4SE music server seems a very impressive piece of digital electronics. The latest iteration includes a new ‘BitScrubber’ noise elimination board, the company’s own Wax music management software (PC driven, but also on an intranet web-page for tablet users), and more. This $6,000 digital front end showed a lot of promise. The TechDAS turntables are proving to be some of the most popular designs at the top-end of the high-end. At $27,000, the Air Force III is the brand’s ‘entry level’ model. It has been shown at several events since its launch earlier this year, but this was its first sonic outing, and really rather spectacular it is too! BelCanto’s impressive Black Series was the darling of 2015’s show circuit. The line is joined this year by the $25,000 ACI 600 integrated amplifier, a full-spec 300W design complete with phono stage, DAC, Ethernet streaming, MQA support, an impressive headphone amp. Again seen but not heard earlier this year, this sounded very tasty coupled to a pair of Verity Parsifal Anniversary loudspeakers and WyWires Diamond cabling. Bricasti Design recently added the M12 source controller to the (gold and black) M1 DAC and M28 mono power amplifiers. However, at RMAF, Bricasti completed the line up with the new $18,000 M15 stereo amplifier, essentially taking all the benefits of the M28s in a single stereo chassis. This system (sporting ZenSati cables and Tidal loudspeakers) was extremely precise and detailed. Burwell and Sons is a maker of very fine horn loudspeakers, based around the classic Altec Voice of the Theater designs. The company trawls modernising movie theatres in search of classic Altec and Western Electric loudspeaker units, that are lovingly restored, and implanted into some of the nicest looking cabinets this side of Living Voice Vox Olympians. 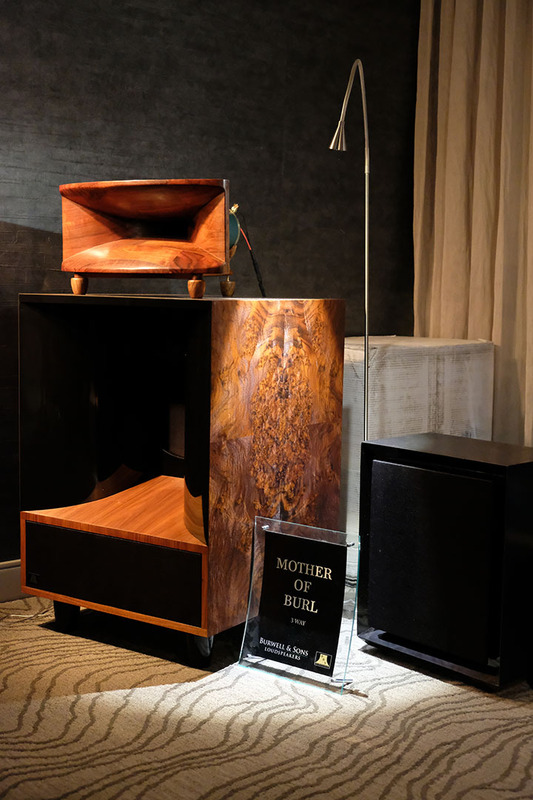 This particular set – the deliciously named $80,000 Mother of Burl – came complete with a pair of subwoofers to handle the bass, and the room was driven effortlessly by these reborn classics.